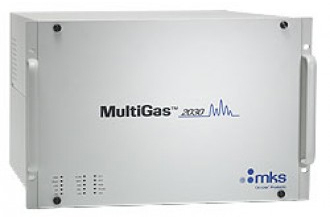 AMP-Cherokee offers MKS MultiGas™ 2030 CEM FTIR-based gas analyzer permanent and rental systems designed for continuous monitoring of emissions in effluent streams containing up to 40% of water. Permanently stored calibration spectra reduces the need for costly reference gas mixtures. MultiGas™ 2030 analyzer contains a 2102 Process FTIR Spectrometer, a patented, high-optical-throughput sampling cell, applications-specific analysis software, and an instrument-independent, quantitative spectral library. It incorporates a novel long wavelength thermoelectrically (TE) cooled detector for more accurate, highly sensitive measurement of most gases and vapors in high moisture streams (up to 40%), producing high resolution spectra (0.5cm-1), enabling detection and measurement of components such as SO2, NO2 and NO, without removing the moisture. Purge Pressure: 20 psig (1.5 bar) max. Contact AMP-Cherokee today at 800.399.4236 or via email at sales@ampcherokee.com for a free consultation on your compliance monitoring and process performance requirements.